"Tour-de-force* Magnificent* Astonishing. 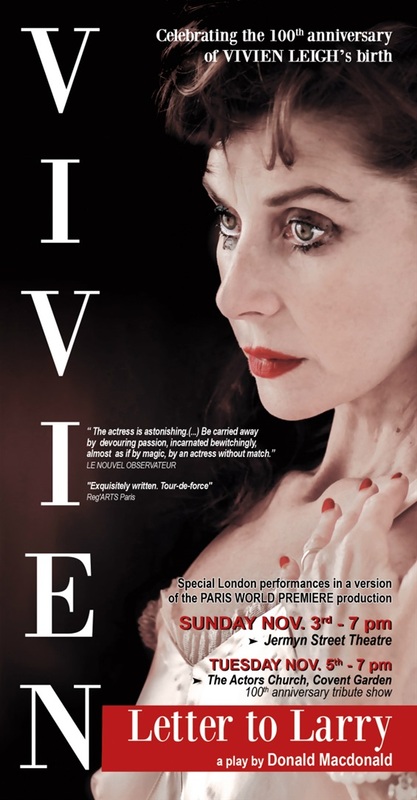 *Vivien lives again* Exquisitely written* Perfect direction* An interpretation of genius* Bewitchingly played* Perfectly staged* Excellent*.You will be captivated* Haunting, poignant* Totally impressive and emotionally stirring* Absolutely perfect* Respendent. Disarming. Disturbing. Beautiful* A great moment in theatre- the love, the passion and talent of Vivien are met in a great actress, Susie Lindeman* Dazzling. * A touching unique solitary star who continues to shine*"
Starring Susie Lindeman as Vivien Leigh.